Carey Nieuwhof concludes Chapter 5 of Didn’t See It Coming as he talks about the demise of two vital things that make people feel distant from others. 1. The demise of genuine conversation. Pastor Nieuwhof observes that people today appear to talk at one another more than they talk with one another. Thus, conversations devolve into an exchange of monologues between uninterested people. In other words, people talk right past one another. Finally, Carey believes, social media contributes to this decline. He posits that we’ve gotten so used to posting status updates we’ve turned into mini-broadcasters. But if you converse only in monologues, you eventually feel deep loss. 2. 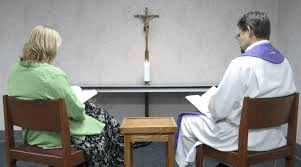 The death of confession. The author considers the disappearance of confession an even deeper issue than the death of genuine conversation. As a result, this shift away from confession leaves people in a precarious state. Today’s question: Do you ever display an allergy to applying the word sin to your life? Please share.